Such is Wall Street that when your revenue increases 2.5% year-over-year, and your net income increases 17%, that your stock plummets like your company is going out of business. On the expenses side, it is interesting to note that Oracle increased its sales and marketing budget by almost 11% compared to the same quarter last year. Oracle President Mark Hurd made a point of it, saying that Oracle has put “1,700 incremental sales resources into the field” since the beginning of the company’s fiscal year, which started in September. Hurd added that Oracle has shown “strong expense discipline” while adding sales staff. Yep, that sounds about right. Hardware products and support expenses dropped 10% and 28%, respectively. Software licensing and product support expenses were also down 3% year over year. In other words, Oracle sales and marketing has been trending up since early 2010, while investment in Oracle products and support has been trending down. What does this mean? Well, many Oracle customers complain that once they become Oracle customers, Oracle tends to forget about them. Hurd denied this in an interview at Oracle OpenWorld earlier this year. But the company’s SEC filings paint a picture of a company with a boosted sales staff and declining product and support budgets. Oracle announced Weblogic 12c during a live webinar on Thursday. The new version of the company’s Java-based application server is its first major release since Weblogic 11g more than two years ago. Back then, the “g” stood for grid. This time around, the “c” stands for cloud. Oracle Weblogic 12c is meant as an application server for multiple platforms – conventional servers, Oracle appliances like Exalogic, and in the cloud. Weblogic 12c is certified for Java Enterprise Edition (EE) 6. 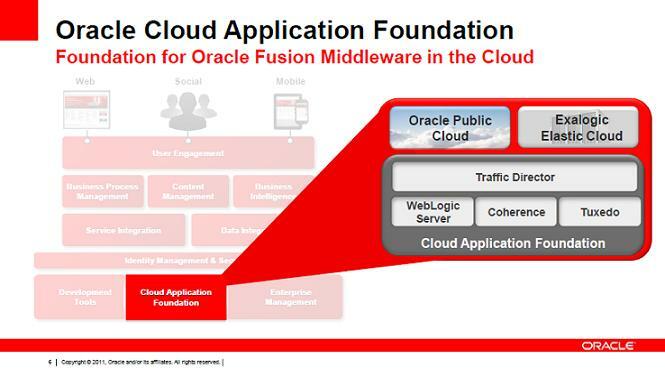 It is meant as a piece of what Oracle is calling its Cloud Application Foundation (picture below). Now, for some reactions. Simon Haslam, an Oracle ACE director and chair of the U.K. Oracle Users Group special interest group on middleware, noted that the zip installer for developers has been “slimmed down,” making it easier for download. Haslam mentioned that an announcement that came with Weblogic 12c was Oracle Virtual Assembly Builder, which will allow Oracle pros to “design and deploy pre-defined collections of ready installed Virtual Machines into different environments (not unlike VMware vCenter Orchestrator).” Haslam thinks it’s a big deal, but he’s not sure whether it will be ready for production out of the gate. Al Hilwa, applications development software director for IDC, wrote the same note to us and to ReadWriteWeb, which published a story on the release. Basically he says the certification for Java EE 6 is a big deal because it brings it “in commercial form” to Oracle Fusion Middleware shops. “Adoption of new versions of Java EE typically moves slowly in the enterprise but offering a certified implementation of the standard framework moves the commercial user migration process along,” he wrote. Finally, Michel Schildmeijer, an Oracle Fusion Middleware architect at Dutch IT consultancy AMIS Technologies, wrote that he was impressed with Weblogic 12c’s integration with Oracle Exalogic. He added that Weblogic 12c’s value will come when other Oracle products move to 12c as well. “WebLogic 12c will be ready for all kinds of other products from the Oracle portfolio like the SOA Suite, WebCenter and so on, although those products will be at the 12c level in the coming 2012/2013 year,” he wrote. Floyd Teter knows there were a lot of big announcements at Oracle OpenWorld this year. But the biggest one, he said, was the announcement that Fusion Applications will be available in the Oracle Public Cloud. Teter is the project management director at Innowave Technology and has long been an important figure in the Oracle applications community. He has also been involved in Oracle Fusion Applications – its development, testing and roll-out. Teter explained that a company building out Fusion Applications in-house requires a lot of expensive infrastructure to do it – hardware, memory, network, etc. That might be OK for large organizations such as Principal Financial Group. But smaller organizations probably won’t be able to afford it. Oracle issued its quarterly security patch yesterday afternoon. There are 77 total security patches, with the most vulnerable being for Java Runtime Environments (JREs). The Java Critical Patch Update includes 20 fixes, 19 of which could be “remotely exploitable without authentication,” meaning they could be exploited over a network without a username and password. Six of them have the highest risk rating possible. Oracle suggests fixing all the vulnerabilities as soon as possible. Over on the database and applications side, the Oracle Critical Patch Update includes 57 fixes on products such as Oracle Database (11g and 10g), Fusion Middleware, Oracle Business Intelligence Enterprise Edition, E-Business Suite, PeopleSoft, Siebel, Sun products and more. Twenty-two of them are remotely exploitable. The most vulnerable issues to patch are in the Solaris operating system. Again, Oracle suggests applying the patch as soon as possible. The next critical patch update is expected Jan. 17, followed by April 17, July 17 and Oct. 16 of 2012. One of the features of the new Oracle Database Appliance is that it offers sub-capacity pricing. That is, you don’t have to license the entire box if you’re not using it. You can just license those cores you are using, and increase that as your business grows. Presumably that affects the cost of the machine. It’s an intriguing concept and one that has been around for a while in the IT world. IBM has been offering it on mainframes for more than a decade. With the Oracle Database Appliance, customers can scale from 2 to 24 processor cores. An Oracle employee told me today that Oracle will allow a customer to scale down once, and only once. As he put it, Oracle doesn’t want customers “playing games” with the sub-capacity feature, scaling up and down frequently during workload peaks and lulls to save money. The Oracle Database Appliance is the first product where Oracle has offered sub-capacity pricing. The question then becomes: Should Oracle offer it elsewhere? It’s a good question. Many very large organizations have unlimited license agreements with Oracle. They pay one (big) cost, and get all the licenses they need. So sub-capacity licensing doesn’t interest them. But in the midmarket, the small-to-medium (SMB) space, sub-capacity pricing could play well. And that is a market that Oracle hasn’t captured as much as other vendors, and where the Oracle Database Appliance plays. The bottom line is that sub-capacity pricing is technically possible on any Oracle platform. The question remains whether Oracle CEO Larry Ellison wants to make that feature available on a wide range of platforms. On the plus side, offering it on other platforms might be a way for Oracle to grab more SMB customers. On the downside, it could mean not getting as much licensing revenue from those customers that they would otherwise get. SAN FRANCISCO – In August I did a podcast with Alex Gorbachev of Pythian and John Appleby of Bluefin Solutions on whether comparing Oracle Exadata to SAP HANA was valid. They both agreed that at that time, it really wasn’t. Well, that has changed this week at Oracle OpenWorld. Oracle’s announcement of Exalytics, an in-memory business analytics server, brings it more in line opposite the in-memory appliance SAP HANA (High-Performance Analytics Appliance), Gorbachev said this week. Oracle consultancy Pythian this week won the North American Titan Award from the Oracle partner network for its help in implementing Exadata at LinkShare, a marketing company in New York. Company officials also told me this week what it will do for potential customers who buy an Oracle database appliance through Pythian. I sat down with EMC Chief Operating Officer Pat Gelsinger today at the Oracle OpenWorld 2011 show in San Francisco. I asked him about Oracle’s stack strategy of selling everything Oracle from the chip to the application, and what he thought of it. “The percentage of servers by volume that are x86 is 96%,” he said. “Revenue is 65%. That means that anything that isn’t based on x86 architecture is niche and declining. Gelsinger has been with EMC since 2009; prior to that he was with Intel for 30 years. So I asked him how the Oracle-EMC relationship has changed over the last couple years with Oracle pushing its own storage and its own virtualization platform now more than ever. “[Oracle and EMC] have 70,000 joint customers,” he said. “So more than anything we find ourselves working together to support and enable our core products with their core products. Gelsinger pointed to the large number of joint customers and the fact that EMC gave the day one keynote at OpenWorld to prove that the Oracle-EMC relationship is sound. While that may be true now, last year’s OpenWorld included a keynote from HP, which also has thousands of joint customers with Oracle. Things can sometimes change in a hurry. Just got to San Francisco earlier today. Had a chance to go to Moscone North and saw a big sign for “Exalytics,” something we previewed here on Friday. Now I have a few more details in anticipation of Oracle CEO Larry Ellison’s keynote address later today. From the looks of the picture outside the hall where the keynote will be, Exalytics is not a full-rack machine. It looks like it’s a quarter-rack maximum, but actually more like about 5U high. Maybe there will be options for other heights as well. Not sure. The details were sparse but the picture said it is meant to run Hadoop and Oracle’s yet-to-be-announced NoSQL database, and be integrated with Exadata, the company’s database appliance. Check SearchOracle.com for more details after the keynote, or follow us on Twitter @OracleTT. Update: Looks like there are two separate things here. One is Exalytics, meant to run Hadoop and Oracle NoSQL. That looks like a 4U appliance. There appears to be another, second machine meant for big data which is a full-rack appliance. Oracle OpenWorld 2011 will be taking over San Francisco Oct. 2-6, with its more than 40,000 attendees checking out keynotes, sessions, demos, and events on blocked-off streets around the city. The conference has thousands of sessions on the various products Oracle and other related vendors have to offer. It is chock-full of sessions that include direct end user insights on their implementations of various projects such as Exadata, Fusion Applications, E-Business Suite, PeopleSoft, Siebel, J.D. Edwards, Oracle Database 11g and MySQL, and others. Of course, having so much can be confusing – sometimes it is tough to filter through everything and find what you want. So in addition to checking out the OpenWorld Schedule Builder, here are a few tips on what’s happening this year at OpenWorld, and what sessions I, readers and members of our advisory board are attending. Let’s first take a look at expected announcements. At Oracle’s most recent earnings call, CEO Lawrence Ellison said the company planned on announcing four engineered systems in the near future. Since then, Oracle has announced the Oracle Database Appliance and the Sparc SuperCluster T4-4. So what will the other two be? All indications are that one of them will be something code-named Exalytics. Yes, another Exa- device. According to IT Consultant Scott Tiazkun, the product will be an engineeered system built for business analytics. Tiazkun isn’t too high on it, pointing to what he thinks has been little success with Oracle’s major systems announcement last year, Exalogic. Ellison also said at the company’s last earnings call that Oracle will be announcing a big data engineered system related to and using Hadoop, a popular open-source big data platform. There have since been reports that the announcement will be an Oracle NoSQL database that includes in-memory features as well. As for the other engineered system that Oracle will announce, who knows? Last year, IDC analyst Al Hilway predicted that Oracle would come out with something this year called ExaFusion – that is, a server appliance for Fusion Applications. So that is a possibility. As for me, I’ll be there Sunday to Thursday and attending sessions on Exadata, Exalogic, Fusion Applications, E-Business Suite and other Oracle ERP applications, and more. My colleague Barney Beal will be covering CRM and other Oracle news. We’ll also have folks covering the JavaOne conference as well. Vinod Haval from Bank of America will be taking part in several sessions, including an Exadata customer panel and Q&A as well as being a guest speaker at the Oracle Enterprise Architecture Summit. He is looking forward to the keynote addresses and data warehousing sessions. On Monday SearchOracle.com will publish a conference landing page where you’ll be able to find the best comprehensive coverage of OpenWorld, Oracle Develop and JavaOne. Check it out.